This is the story of the forgotten people who made the Canal work - they stayed on through the tough times after the canal opened in 1832 and Lt. Col. By left. Their dedication is celebrated in this new book, available at a bookstore near you - or available at www.rideaufriends.com/sales/. Many books about the Rideau grudgingly include only Lt. Col. By and mention the initial construction crews-the wood, masonry, engineering and natural landscapes are their real concern. Rideau heritage is so much more. One reviewer commented: "(…) Invisible Army provides us with another essential dimension of the story: a rich account of the routines, rhythms and experiences of those who maintained and operated the Rideau." The overarching focus is on the lives of the lockmasters and lock staff, as well as "the rest of the troops"-the carpenters, divers, masons and blacksmiths-the "Rideau Navy"-men and women who worked on the tugs, dredges and scows. There are lists of the names-station by station-1832 to the present. Much of the information is from former and current Canal staff. Another reviewer said:"…the detail is quite fascinating for a modern day reader. I particularly like the explanatory Notes feature, which provides additional comment and context with respect to the sources cited, and the matters dealt with in the various chapters. (…) For me personally the manuscript yields a lot of very interesting information on working life, wage rates, and operational procedures with respect to the lockmasters and lock labourers. No doubt the families of the workers, whom you've named, will be fascinated in reading about what their grandfathers, fathers and uncles, were up to on the Rideau Canal." 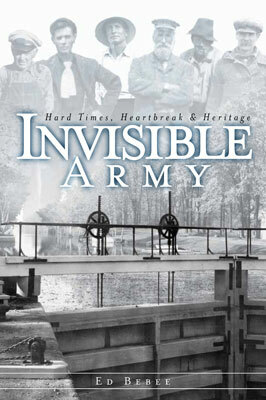 "Invisible Army," 480 pages; 6" x 9" (portrait); paperback; colour cover, b & w interior with pictures and illustrations. References. First printing 2010. ISBN 978-0-9696052-4-9. $9.95. For purchase information, have a look at the Sales Page.